It’s not hard to remember a time when the thought of using anything other than a block of soap in the shower wouldn’t have washed with most men. But these days guys know that if you want to smell great from AM to PM, you can’t rely on aftershave alone. Fortunately, most body washes do well to replicate the scents of their eau de toilette siblings (or at least give them a leg up). So, whether you’re a first-thing-in-the-morning or just-before-bed kinda guy, here’s everything you need to know about shower gels, and the 15 best for making a clean getaway every day. Picking a product that you don’t mind rubbing more or less over every inch of your skin is no lathering matter. While it’s easy to get overwhelmed by the aisles (and aisles, and aisles) of options, it pays to get it right. One of the earliest decisions to make is selecting between body wash and shower gel, which (unlike kale and stale garbage) aren’t two words for the same thing. “Body washes and shower gels are similar in that they both use mild surfactants to cleanse the skin, but the main difference lies in their texture,” explains Simon Duffy, founder of Bulldog Skincare For Men. That’s not to say that gels don’t help lock moisture into the skin (in fact, there are plenty below that do just that). The only soap form you really should give the slip is the old bar, which, according to the Indian Journal of Dermatology, usually contains a much higher pH and can dry out the skin or even exacerbate dermatological conditions such as acne, rosacea or eczema. With the shower science ticked off, you can’t get on with finding a formula that strikes the right balance between smelling good and being gentle on the skin. Whether you need a formulation to haul you out of bed in the morning, get rid of gym-generated odours or slough away dead skin, here are some of the very best to suit all bodies and all budgets. Go looking for low-cost, high-quality body wash and you’ll be showered with options, but only a few will give a lather and rinse you’ll want to repeat. These everyday options hit the sweet (smelling) spot every time. Grab a loofah. For grooming products at an affordable price point, there are few better brands than L’Oréal Paris Men Expert. Its Hydra Energetic Shower Gel is packed with vitamins to deliver a concentrated wake-up when its needed most. As any man who has ever attempted to hold on to a lathered bottle like one of those nineties water snake toys will tell you, plumping for a pump – like the one on this dual-action shower and shave foam by Lynx – has its payoffs. Even after shaving your legs with a shower cap on, you won’t have to turn in your man card if using Molton Brown’s Black Peppercorn Body Wash. The strong, masculine scent has been a best-seller for the British brand since 2002. Pull the plug on carrying an over-stuffed grooming bag to and from the gym. Instead, opt for a multipurpose face, hair and body cleanser that works to get rid of dirt and sweat without stripping away essential natural oils. Many men will be familiar with American Crew’s range of hair products as the stuff used in barbershops across the country. However, the brand also makes a 3-in-1 shampoo, conditioner and body wash that works to eliminate odour from all angles rather than masking it with a heavy fragrance. For when you want the coffee jolt without the hassle of boiling a kettle like a Victorian, reach for Kiehl’s award-winning Body Fuel Wash. The invigorating formula comes pre-loaded with a hit of caffeine, as well as vitamin C, zinc and menthol. It’ll have you sprinting to work. Wouldn’t it be great if you could spend less time in the shops intermittently replacing 15 different products, clear a bit of space in your bathroom and maybe even save some coins along the way? With Lab Series All in One formula – which covers face, body, hair and shave – we think it might be possible. Most of us have far too much month at the end of our money, so it makes sense to look for ways to make things go that bit further. Amp up your olfactory efforts in the shower by giving your fragrance a base layer to last all day with a matching body wash.
Tom Ford’s Neroli Portofino redefined the classic eau de cologne, but it comes with a price tag to match. Answering the demand (and 4,875 emails from the FashionBeans grooming desk) for a more affordable option, the designer released a shower gel version that packs the same zesty mix of Sicilian lemon, neroli and lavender. Even if you’re not one for dousing yourself in EDT after, Acqua Di Parma’s rich, oud-infused hair and shower gel will have passersby begging you to come clean about your scent. In short: it’s one to hide away if you live with flatmates. With notes of fresh iris, neroli and amber leaving an almost soapy scent in your schnoz, Prada’s L’Homme fragrance was a natural choice for the brand to turn into a luxury lather. A good glug of this first thing and you’ll have people chasing down the street after you the whole day. It may sound superficial to take into account the bottle design when buying a shower gel, but it’s the easiest way to transform your mould-ridden bathroom into a five-star spa. Well, actually that would be getting rid of the mould. But you get the idea. Aesop’s squat brown apothecary bottles have been upgrading bathroom arsenals since 1987. 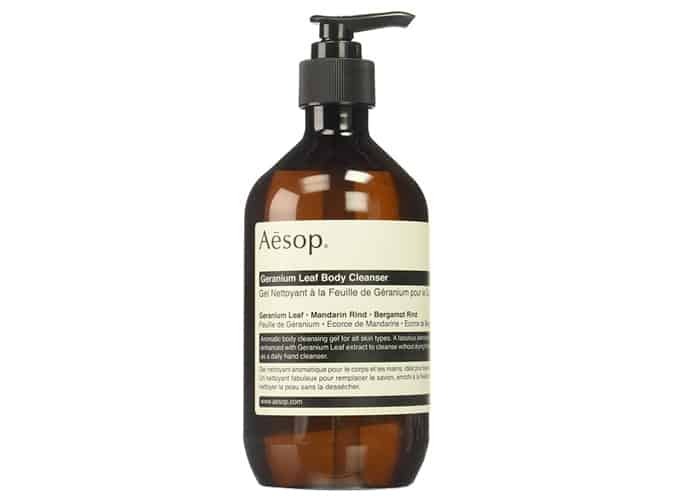 This one houses a botanically-enhanced cleanser that gently removes grime, banishes odour and leaves skin smelling of fresh ingredients including bergamot and geranium leaf. Just because a shower gel is an everyday essential, doesn’t mean it has to be boring. Take Clinique’s Happy Body And Hair Wash. Even if a heavy hit lime and mandarin isn’t enough to jolt you to life in the morning, the bright orange colourway certainly will be. It’s what’s on the inside that counts, sure – this one helpfully comes packing amino-acids and natural bergamot to gently cleanse, purify and balance all skin types – but it’s hard not to admire the bottles used by family-run firm Malin + Goetz. Plenty of body washes claim to moisturise but end up doing the opposite. For guys with sensitive complexions, that’s a shower-based shortcut to dry, itchy and crusty-as-hell skin. Defend your dermis with a body wash designed to lock in hydration and allow the skin to repair itself. You don’t need deep pockets to take good care of your body. Since 2006 Bulldog Skincare for Men has given bigger grooming companies a run for their money with cost-effective formulations that get the job done. The brand’s Original Shower Gel is loaded with skin-saving vitamins, assorted botanicals and a myriad of essential oils. Korres’ Santorini Vine contains wheat proteins that form a protective film on the skin, maintaining regular hydration levels. Even better than its distinct, naturally sweet aroma is the fact its also available as a miniature, so you never need let your scent game slip.